Moist on the inside, golden brown and crisp on the outside, these Sweedish Meatballs go perfect served with egg noodles and topped with a creamy brown gravy. When it comes to shopping, I love a good deal… like buy one get one free. It makes me feel good when I save some cash! In the kitchen, I love a good deal too because it always saves some time. For example, I love when I can make one meal, and get one free. You know what I’m talking about right? It’s when you make a recipe, and that same recipe can be made into all kinds of other meals so that even though you are eating “leftovers”, it’s a whole new experience and feels like a completely different meal. One recipe I’ve found that fits the description of “a good deal” is Swedish Meatballs, or any meatball for that matter. This recipe can be served a TON of different ways! In our house they were served over egg noodles with a creamy brown gravy, and then, these meatballs were used for a fantastic meatball sub sandwich. Now, one of the main differences between Italian meatballs and Swedish meatballs is the sauce. Obviously Italian meatballs are served with some sort of marinara sauce while Swedish meatballs typically have more of a brown gravy sauce. I broke the rules making meatball subs out of the “Swedish” meatballs and used a marinara sauce to go with it. So technically I made Swedian (combo of Swedish and Italian… get it?) meatball subs, but they were good, so that’s all that matters, right? Whether you choose to serve these Swedish meatballs over egg noodles with gravy, or you choose to turn them into a sub sandwich, either way, you can’t go wrong. Enjoy! In a small bowl, mix together heavy cream and breadcrumbs. This mixture becomes thick really quickly, which is what you want. Let it sit a bit if needed and wait for it to become thick. In another small bowl, whisk the egg together with the onion powder, garlic powder, nutmeg, and salt. In a large bowl, pour the cream/breadcrumb mixture over the ground beef. Add in the egg and seasonings mixture and mix well. Go ahead and use your hands, it feels slimy and gross, but will mix together quickly. Alternatively you could also mix all of the ingredients in your food processor to combine. Once meat mixture is ready, begin forming into 1 ounce balls. I used a tablespoon to help me form the perfect sized meatballs. When the water in your stockpot is boiling, drop your meatballs in to cook. You’ll need to do these in batches. If you drop too many meatballs in at one time, they’ll stick together. When the meatballs start floating, they’re done. This only takes a couple of minutes. In a skillet, melt two tablespoons of butter over medium heat. When the meatballs are done cooking in the stockpot of boiling water, drop them in the skillet to brown them up. Turn occasionally until you get the desired brownness, then remove from pan. Sprinkle freshly chopped parsley over the top of the meatballs (optional). In the same skillet you used to brown the meatballs (medium heat), sprinkle 1/4 cup flour. Whisk until it starts to lightly brown (just a couple of minutes). Slowly pour in beef broth, continuing to whisk well. When the gravy starts to thicken, pour in heavy cream and cook until it thickens to the consistency you’re looking for. 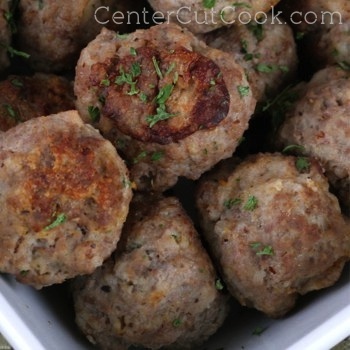 Note: If you’d like to make meatball subs out of these meatballs, you’ll just need some marinara sauce, mozzarella cheese, sub rolls, and a tablespoon of butter. In a skillet, melt the butter and toast the sub roll a few minutes on each side. Heat the marinara sauce in the microwave for a minute or two. Arrange meatballs on toasted roll, top with mozzarella cheese, marinara sauce and serve.